Securing the future of magic with scholarships for young magicians. We are pleased to bring back our Magifest Youth Scholarship Program. The idea is simple: every young magician who wants to come to Magifest should have the opportunity to come. And a lack of funds should never prevent anyone from enjoying this life-changing event. The Magifest has changed the lives of so many people, and we’re eager for this convention to change the lives of the next generation of magic. 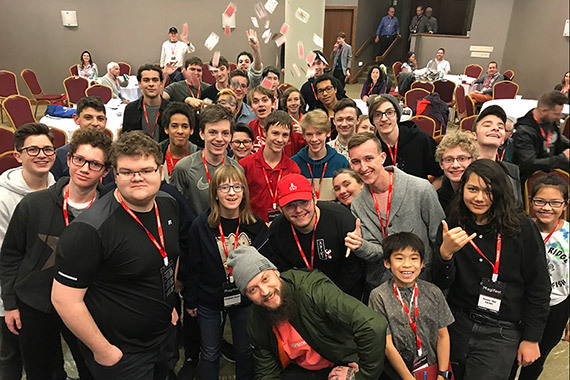 Our youth program is one of the brightest in magic, and we have a huge contingency of young, talented magicians that participate in our events, and in our special youth workshop. To qualify for the scholarship, every applicant must perform a show for charity and provide two forms of documentation of the show. The charity show must take place from May 1-November 1st, 2018. There must be no financial remuneration for the applicant. Accepted documentation includes a letter of appreciation on the charity organization’s letterhead, a press clipping about the event stating the date, name of performer, and name of charity. As a second form of documentation, you must provide photographic evidence captured during the show or immediately following. By submitting this documentation, applicants are also giving consent for these letters and photos to be projected during the convention and published on the Magifest website. • These recipients will receive a full scholarship for themselves and one parent (note: for legal reasons the guardian MUST be a relative) to attend the Magifest for FREE. • Make sure to indicate if you have received the scholarship previously (this will not affect your chances at all) and whether you require further financial assistance for hotel. There is a limited fund that can help with accommodations on the basis of financial need. • You must be under eighteen on January 1st 2020 to apply. Closing date for applications is November 1st 2019. Applications after that date cannot be accepted. Our youth scholarship is jointly sponsored by Vanishing Inc. Magic and our attendees. If you feel as though you are able to help contribute, please email us.